I’m very excited to welcome the participants of ‘One planet – one ocean’, a Massive Open Online Course. From watching earlier Q&A sessions, I can see that you come from all around the world, and from all walks of life. For those of you who would like to dig deeper into Topic 10.5, ‘Sustainable Energy from the Ocean’, I have put together this fact sheet (liberally sprinkled with opinion). I used the questions and comments you left next to this lecture to decide what to include. I will be a guest speaker on the Q&A session on Marine Renewables this Thursday. I am hoping that this blog post will spark the curiosity of those who were still deciding whether to listen in, and inspire thoughtful questions from those who already know they will be joining us. This article covers the following topics: making the case for marine renewables, a list of the main features of the different types of marine renewables, a technology status update, a discussion of the current challenges, and some thoughts on how marine renewables could fit into a future low carbon energy mix. Why should we consider getting energy from the ocean when we can get energy elsewhere cheaper; when there are other things we could be doing with that ocean space, and so many other concerns to do with the oceans? Here are the reasons that matter. Our civilisation is built on the foundation of an energy-hungry economy. The status quo cannot continue; problems will arise long before rising demand drains the last fossil fuel reserves. If we were to burn all our coal reserves, the changes in climate would throw our world into chaos. Collectively, we need to ensure that the carbon in the ground does not end up in the atmosphere. It is also in our interests to prevent localised energy scarcity, as this has a tendency to be politically destabilising. For these reasons we need to decarbonise our economy. While I do not believe that the solution is as simple as exchanging fossil fuels for renewables, I do think renewables need to be a big part of the solution. Unless we crack fusion, we will need a lot more renewables in the decades to come. Some countries are blessed with a large ocean energy resource; while others have locations that make fossil fuels more expensive. It would be economically and politically advantageous to such countries to harvest marine energy. Furthermore, the prize of building an industry based around a future-proof technology is very attractive. Marine energy is currently expensive compared to renewables that have been developed for decades. Stuff always gets cheaper when you learn how to make it better, and when you make lots of it. This is known as ‘technology learning’. Marine renewables have not yet experienced enough technology learning to know for sure whether they will be competitive when they are mature technologies. Developing marine renewables now acts as an insurance policy, so that we have more options for decarbonisation in the future. One of David Mackay’s biggest concerns about renewables was the vast land area required to replace our fossil fuel needs, and concerns that this would compete with food production. With rising population and sea levels, the land area per person available for renewable energy production is decreasing. In the ocean, there is less competition for space. Ironically, those most concerned about loosing space to marine renewables, fishermen, will benefit in the long run. One sure way to avert the looming tragedy of the commons due to overfishing is to impose reserves where fish can regenerate. This is often missing from lists of marine renewables, but it is technically possible to grow seaweed as a fuel. 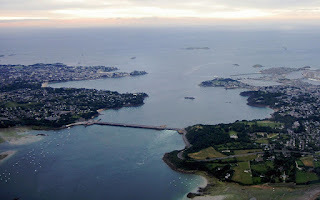 It is not currently being exploited, as it is presently more expensive to grow plants (biomass) in the sea than on land. 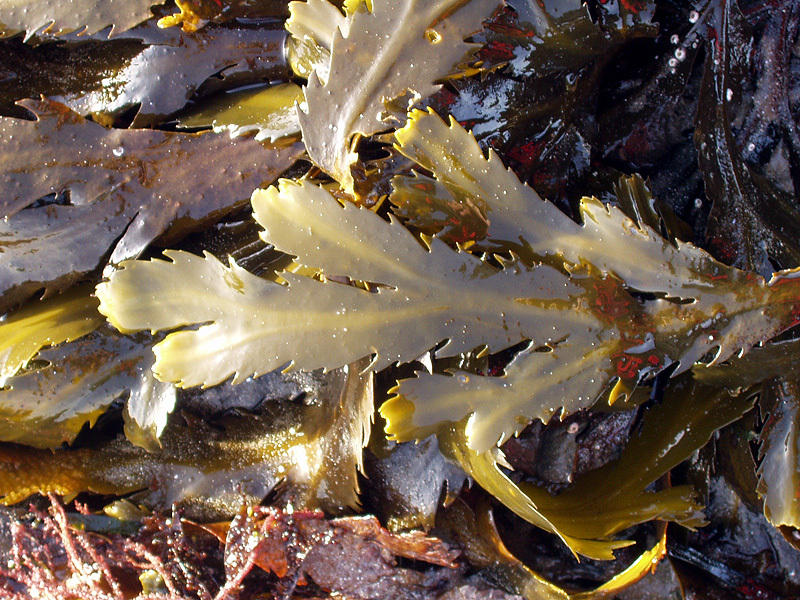 As nutrient-rich seaweeds are used as food and animal fodder, there is some concern that biomass production could displace food production. However, seaweed is not currently being exploited intensively, so it should be possible to grow fuel in the sea without having a significant impact on food security. The challenges are to reduce production costs, and to develop more efficient alternatives to burning unprocessed seaweeds, such as first creating liquid or gas biofuels. With over 12GW operational installed capacity, offshore wind is the most mature marine renewable. It is not always classed as a marine renewable, as the energy captured comes from the wind rather than the ocean. However, it makes use of sea rather than land area, interacts with marine ecosystems, and experiences operational challenges due to the marine environment. 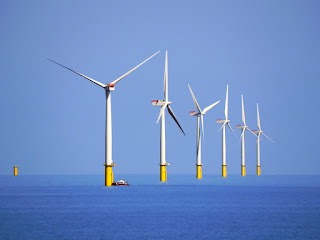 Hence people working in wind energy consider offshore wind to be a marine renewable. Wind energy is a concentrated form of solar energy, as the driving thermal gradients are caused by the sun. Offshore wind is currently more expensive than onshore wind, as there are several new challenges that need to be solved: limited weather windows for doing repairs, and the costs of installation and repair. Marine installation vessels are more expensive than their land equivalents. There is the cost of the additional under water structure, which attracts wave loads and acts as a lever arm, turning forces on the top of the turbine into turning moments on the foundations. Despite these disadvantages, engineering multinationals are investing development effort into offshore wind because of its huge potential. The resource is large, so this represents a large future income stream. Wind energy can be made cheaper with economies of scale: huge turbines, installed in vast arrays. On land, industrial scale wind farms will be limited by competition with other land uses. So in the future, offshore wind may be cheaper than onshore wind. There are also some technical advantages of offshore wind, such as the higher wind speeds, and the ease of transporting large structures. Like wind energy, wave energy is a form of concentrated solar energy. This is because waves are caused by the wind blowing over long expanses of ocean. The waves travel thousands of kilometres in the direction of the winds that created them, until the energy is dissipated by bottom friction or wave breaking. While the wave itself travels in one direction, the water particles oscillate, moving in circular orbits. They move both up & down (potential energy) and back & forth (kinetic energy). As the particles reach a crest or trough, they slow to a halt. All their kinetic energy is exchanged for potential energy, like a pendulum at its highest point. As waves pass into shallow waters, the particle orbits become elliptical. Even though what we notice is the up & down motion, shallow water waves have more side to side motion. Some wave energy devices work by bobbing up & down, capturing the potential energy of the wave. This works best in deep water. In shallow waters, devices that extract energy from the back & forth motion of the waves are more economic. This is why we see such different looking devices for shallow (e.g. Oyster) and deep waters (e.g. Ceto). Of course, for deep water devices, there is ultimately no reason why we should only attempt to capture half the energy. At the moment the many devices that work by bobbing up and down reflects the need for a step by step development approach. Reliability is a big problem for any new technology, and even more so for anything that is going to be put somewhere that is difficult to access for maintenance, so there is a strong drive to limit system complexity until the teething problems have been worked through. Ocean currents are caused by a mean flow of water in the ocean. There are various things that cause this flow, including the earth’s rotation, wind, waves, and salinity and temperature differences. The description just given of the circular particle orbits in ocean waves was a simplification: in fact, each particle slightly overshoots its starting position (see anmation), resulting in a mean drift in the direction the wave is travelling. The currents arising from these various sources are concentrated in narrow bands, rather than averaging out in the surrounding waters (see video below). They can be visualised as conveyor belts: water flows to fill the place of water that has recently vacated. Ocean currents do not fluctuate in direction, but their positions do meander in a chaotic fashion. Obstructions often cause vortices to break off from the main current, and these vortices tend to get dragged along with the current, so that there can be localised conditions where the current appears to change direction. Ocean currents are three dimensional disturbances: it is possible to have a surface current in one direction, overlaying a deep ocean current in another direction. Tidal streams are distinct from ocean currents. They are caused by a difference in tidal level, and this in turn is caused by the gravitational attraction of celestial bodies, principally the sun and moon. The flow is driven by a difference in head (water height), so happens all the way down to the seabed, and across the whole expanse of the ocean. When tidal flow is obstructed by land masses, it is concentrated and diverted, which can result in high velocities. These tidal streams change direction with the tides, and using harmonic analysis, can be predicted years in advance. The available resource is less than that of wave energy. However, the resource is very localised, so the incentive for development is more about energy security than building a global industry. 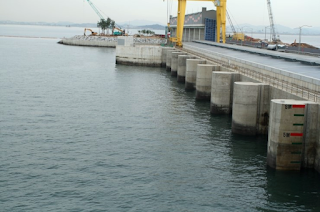 Tidal barrage technology makes direct use of difference in tidal head. In some parts of the world, there is a very large tidal range due to local amplification. Tidal barrage is to tidal stream what hydropower dams are to run of river turbines: they can capture a greater proportion of the available energy, but they require construction of an expensive impoundment with a lifespan that greatly exceeds the timeline over which the project’s economic viability will be determined. 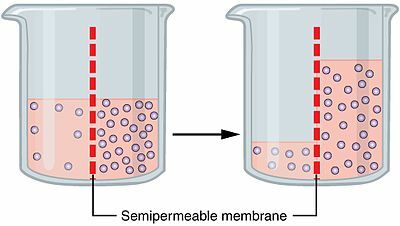 Osmosis is driven by a difference in concentration of solutions that are in contact via a semipermeable membrane. It is possible to generate power from osmosis between salty sea water and fresh river water. Water will migrate across a membrane in order to balance out a difference in salinity. An example of a semipermeable membrane is the skin of a slug, which is why salt is lethal for these creatures. The salinity difference causes an osmotic pressure: this is the pressure you need to put on the salty water to stop fresh water leaking through the membrane. If the two bodies of water are in walled off areas, the exchange of water will result in a head (height) difference, which can be used to generate electricity. The energy has been gained at the expense of increasing the disorder of the system: instead of some fresh water and some sea water, you get less useful brackish water and some energy. A temperature gradient can be made to do work. It requires a working fluid that is a liquid when in contact with the cooler temperature, and becomes a gas when in contact with the higher temperature. To get temperature differences high enough requires water from the ocean surface and the deep ocean off the continental shelf. This technique is currently an order of magnitude too expensive. Challenges include the energy demand in pumping the deep water up to the surface, the low efficiency due to the small temperature difference, and biofouling, which can degrade efficient heat transfer. At-sea is a spin-off company that came out of an EU consortium that developed a method for farming seaweed on sheets of fabric (see video below). 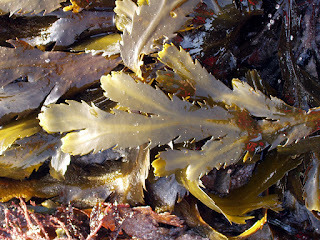 There are also consortia in the UK and the Netherlands investigating fuel production from seaweed. Extraction of power from ocean currents is not being developed commercially, but it is being researched, for example in the US, South Africa and Japan. The 240MW Rance tidal barrage in France has been operating since 1966. The 254MW Sihwa barrage in South Korea was built in 2011. Both were state funded. The long lifetime of the structures and up-front costs make it difficult to justify barrage schemes using standard economic methods, which ‘discount’ revenues earned in the future. Several designs for a barrage across the Severn were shown to be too expensive. There are now plans to build a tidal lagoon in the Severn estuary, near Swansea. There is a 50kW demonstration project in Japan, and a 105kW demonstration project in Hawaii. A French project has won funding to build a 10MW offshore plant in Martinique. There have been several seawater air conditioning projects installed. There was a 4kW demonstration plant in Norway, but it was discontinued in 2013 as it did not generate enough power to break even. Since then, researchers have been exploring more efficient membranes and alternative ways of extracting power from salinity gradients, such as reverse electrodialysis and capacitive mixing. 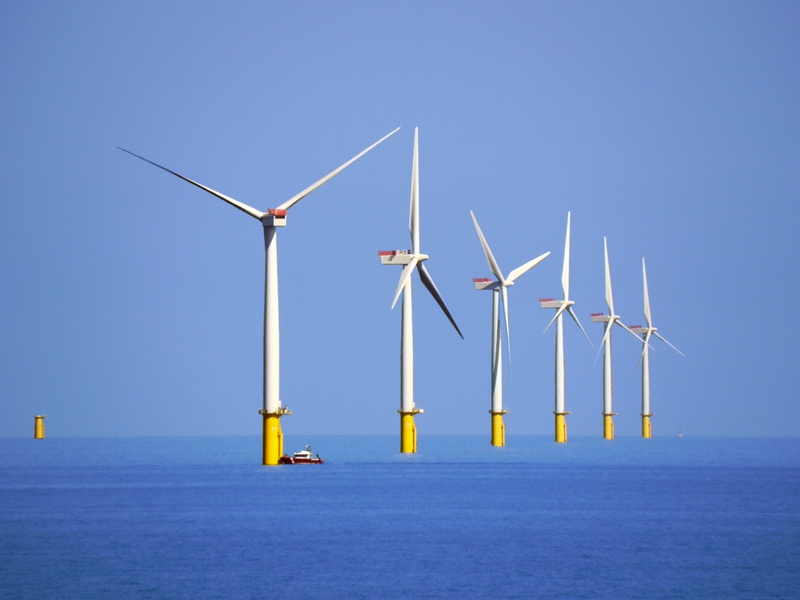 It is a very exciting time for offshore wind at the moment. While onshore wind can be said to be reaching maturity, with a clear design convergence, there is still plenty of room for innovation in offshore wind. With limited weather windows for maintenance, reliability is crucial. 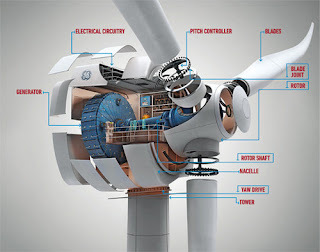 Gearboxes have always been a large source of failures for wind energy, and they make upscaling (making each generation of the technology ever bigger) more difficult. Bigger turbines need more gearing. Bigger gears are more expensive, and more gear stages are less reliable. So there is a lot of cutting edge development of alternatives to cogged gears. One option is to use hydraulic transmission, like that used in diggers. Mitsubishi are testing a 7MW transmission system that will eliminate both gears and power electronics. Another option is a multipole direct drive generator, such as that developed by GE. Instead of using gears to speed up the magnetic flux passing the coils of wire in the generator, you instead use many pairs of magnets (poles) so that a slow rotation results in flux passing through the coils at high speed. As mentioned, there is economic pressure to develop larger turbines. This has associated challenges. Bigger turbines have to resist more down-wind forces (thrust). Bigger installation vessels are more expensive. If we want to install industrial scale wind, we will need to go to deep water. Hence another area of innovation is around foundations. 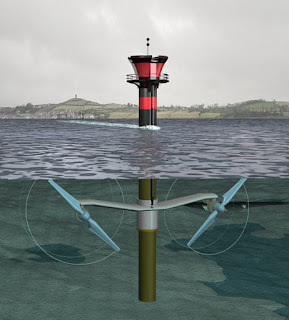 There is currently a lot of research and development into floating wind turbines, and anchoring turbines using tension legs similar to those used for oil platforms. 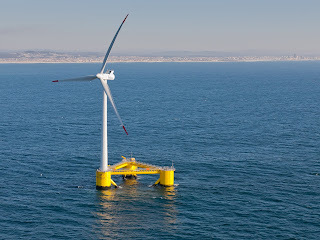 To the right is a photogaph of a prototype of a floating wind turbine currently being tested in Portugal. 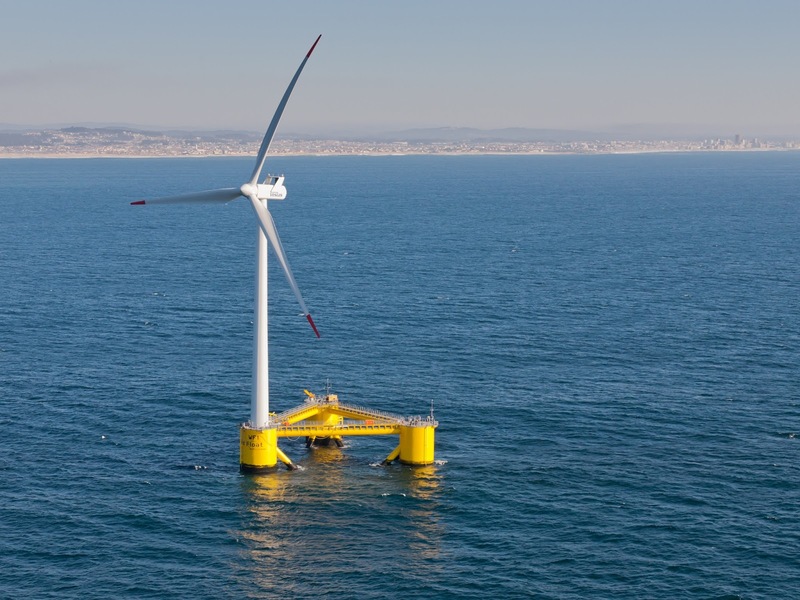 Commercial offshore wind is being built by consortia of big engineering companies and utilities, using turbines rated between 3 and 6 MW each, and following strict engineering standards. Even with subsidy support, the profit margins are narrow, and the companies involved have their eye on long-term strategic goals. The markets are very volatile, with companies joining and exiting consortia regularly. 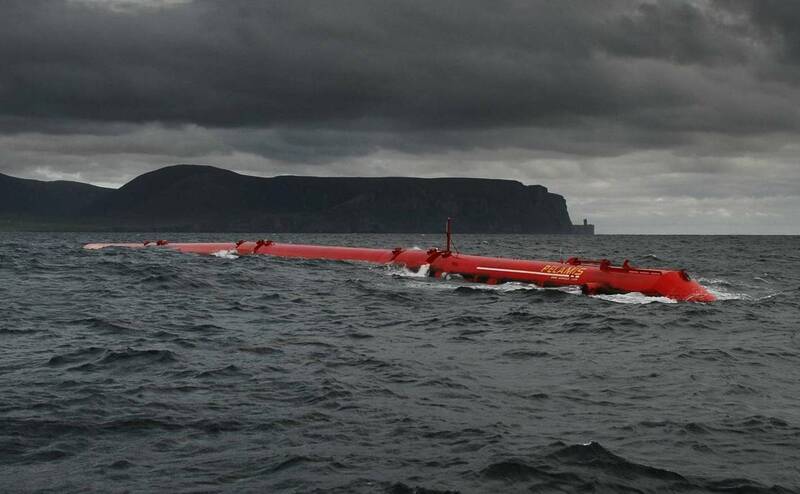 Four years ago, Scotland was a world leader in the development of wave energy technology. Several prototypes were tested for limited periods at the European Marine Energy Centre in Orkney. Pelamis had tested their first-generation prototype in Orkney, then installed three more in Portugal for a few months, and later tested two of their second-generation machines on and off over a couple of years at Orkney. WaveGen had used their experience from the Limpet prototype in Scotland to install a 300kW array of turbines on a Spanish breakwater. Inverness-based AWS had tested a model of their version of the CLAM device at Loch Ness, and were continuing development with investment from Alstom. Aquamarine Power had tested the first- and second-generation of their Oyster device at Orkney. Then, a few years ago, wave energy experienced a market crash. Utilities had become less enthusiastic about buying untested technology, and one by one investors in the wave energy start-ups exited at a loss. The root of the problem was that the organisations whose support funded wave energy development (venture capital, government, utilities, engineering companies) had expectations that didn’t match the development requirements of the technology. Some wanted the first prototype to be bigger than the competitors, some wanted prototypes built as quickly as possible, without the usual engineering checks, and everyone wanted the prototypes to work as expected without failures. With no alternative funding routes, developers in a make or break position made optimistic promises, which, from the investors’ perspectives, were not kept. This resulted in a loss of confidence in wave energy technology. When Pelamis folded, the Scottish government identified the risk of loosing the experience of the people working in wave energy over the last few decades, and set up Wave Energy Scotland. WES aims to win back investor confidence with collaborative, transparent, and fully funded research and development of common sub-systems and innovative designs of wave energy converters. In Britain there are two companies who have avoided the market pressures that undid the companies which lost their investors. One is a small Scottish company that are not aiming at going too big too quickly: Albatern. They are developing devices for the niche market of fish farms. The other is the English company Wavepower, which has an appropriate amount of time and money to develop a device in-house, and that can afford to compare several options before settling on a particular design. There are interesting developments abroad. A couple of Scandinavian companies, Wavestar and Seabased, have done extensive sea trials and are planning to expand. In Australia, a company called CETO is developing a heaving buoy for both desalination and electricity production. Last year they trialled three of their 240kW buoys in Australia with funding from the military. The US has also experienced investor disappointment in wave energy, and has reacted by holding a technology innovation competition: the wave energy prize. The competitors have been whittled down to nine teams, who will test their devices at the same tank next month. Tidal turbine technology is at a turning point. Over the last decade, it went from being a side topic at wave energy conferences, to being the main event. Several demonstration prototypes, such as the twin turbine SeaGen, were installed and operated for long enough to give confidence and gather data. Now there is a race on to install the first pre-commercial clusters. Unlike the earlier prototypes, these are intended to remain installed. France has provided capital grants to support two clusters, using turbines developed in Ireland and Spain. The clusters are under construction, and a few turbines have already been installed. MeyGen is a pre-commercial development in Scotland that will trial two different types of turbine. So far only cables have been laid. 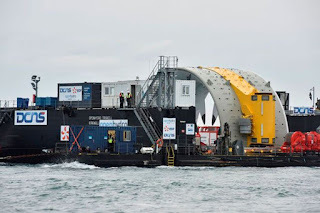 If these pre-commercial clusters are successful, tidal stream technology will see a boom, and this will help reduce the costs to give tidal stream a better chance of being competitive with offshore wind. All the turbines being installed in pre-commercial clusters are single turbines mounted on dedicated seabed supports. There are several companies which are promoting designs for floating support structures for multiple tidal turbines, which offer reductions in costs and embedded carbon. 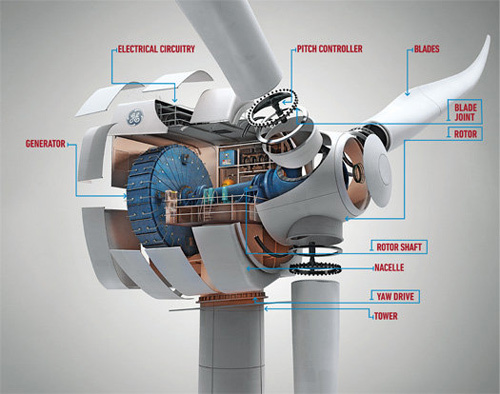 There are also companies developing smaller turbines for niche markets. For example, Tocardo has installed demonstration clusters on Dutch storm surge barriers. These turbines mounted on the seawalls are somewhere between tidal stream and tidal barrage technology. As marine renewables will take some time to develop into mature technologies, it is useful to consider them in the context of future energy systems. One of the challenges of cutting out fossil fuels is that our energy systems depend on the energy storage provided by these fuels. Most renewables (apart from hydro and biofuels) are difficult to turn off during low demand, and impossible to turn on during high demand. Nuclear power can be scheduled, but this needs to be planned weeks in advance, and each reactor is either fully on, or off. As more renewables are incorporated into our energy networks, there will be a premium on technologies that can help balance supply and demand. These include biofuels from seaweeds, OTEC, power from salinity gradients, and tidal barrages. We will not succeed in decarbonising our energy systems unless we tackle the problems of transport and heating. Electrification would certainly allow us to displace more fossil fuels with renewables. However, this would create more problems, such as balancing demand and building more power lines. It is not easy to switch from one infrastructure to another, and there are several applications where is will not be feasible to replace fuels with electricity. This suggests that fuel production would be a good use of marine renewables. Marine biofuels might be very valuable if they allow us to use existing vehicles, heating systems and fuel infrastructures. Fuel production is also an option for marine renewables located far offshore. The additional cost of turning electricity into fuel would be offset by not having to build a power cable to shore. Economic development and climate change will increase the demand for cooling in the future. It may prove to be economic to use cold seawater to displace conventional cooling such as air conditioning. 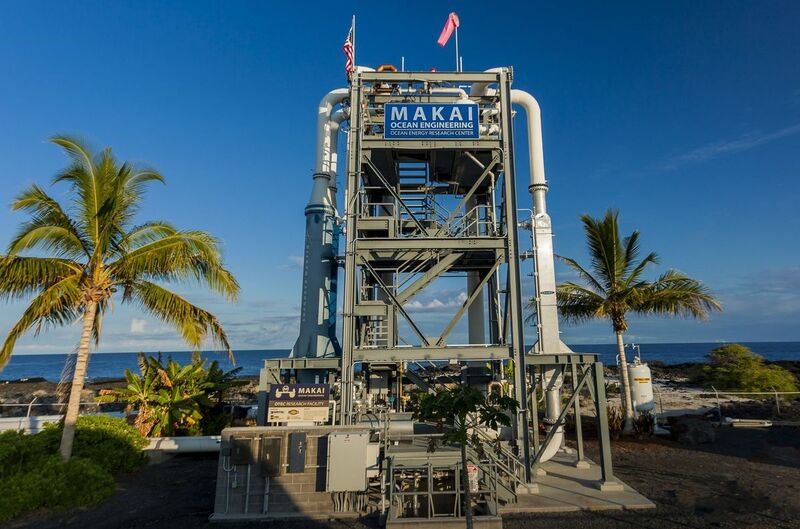 The same systems pumping water for OTEC could be used; but the economically optimum depth to pump seawater for cooling may be different to that for OTEC. There are many island locations, for example in Indonesia, where fuel is expensive due to remoteness. Marine renewables could help the economic and social development of these areas by providing cheaper energy and electrifying areas that were previously without power. As the competition (fossil fuels) is more expensive in these locations, they are well suited to being first markets for new renewable energy technologies that would benefit from being beta-tested at smaller scales. As the amount of fossil fuels that we need to displace is so large, we need to develop renewable sources now, that, when mature, are capable of providing large amounts of affordable power. This is the reason for the interest in offshore wind, wave energy, tidal barrage, and OTEC. We also need to ensure that large scale plants do not have a worse impact on the environment than climate change, and that it doesn't displace other human activities such as living room and food production. This is a key advantage of marine renewables over many land-based renewables. In some parts of the world, there are such dire water shortages that drinking water is manufactured using osmotic processes such as reverse osmosis. This is a very attractive application for marine energy for several reasons. First, the lack of piped water often coexists with expensive electricity, so the fuel for reverse osmosis is expensive. The second reason is the colocation of the raw material and the energy source. Third, many ocean renewables convert mechanical energy into electricity. There may be some efficiency savings in converting mechanical energy directly into the pressure required for reverse osmosis. Both Apple and Google are interested in housing information technology such as servers near or on the ocean. Seawater can be used for cooling, and locally generated marine energy could be used to power these centres. Very nice information,thank you. I look fowards to learning more.